Though we at Von Jakob Winery and Brewery are known for our award-winning Illinois wines and beers, we have so much more to offer like our bed and breakfast cottages. Our Wine House includes three fully stocked suites: The Canyon Gold Suite, the Chateau Suite, and the Cab Sav Suite. Our Port House on the other hand has two suites named after our previously mentioned award-winning Illinois wines: The Red Port Suite and the White Port Suite. If you need the entire Port House, there is also a sleeper sofa in the shared common area. Both cottages also have Jacuzzi tubs and every suite is furnished with comfortable king sized beds so you can be sure to get a great night’s rest. Either cottage makes an excellent choice for a relaxing and/or romantic get-away especially when considering our brewery’s location to much the Shawnee Wine Trail has to offer. In addition to our bed and breakfast cottages, we have our grill and pub. It is a casual environment perfect for having dinner in and maybe grabbing a drink or two. 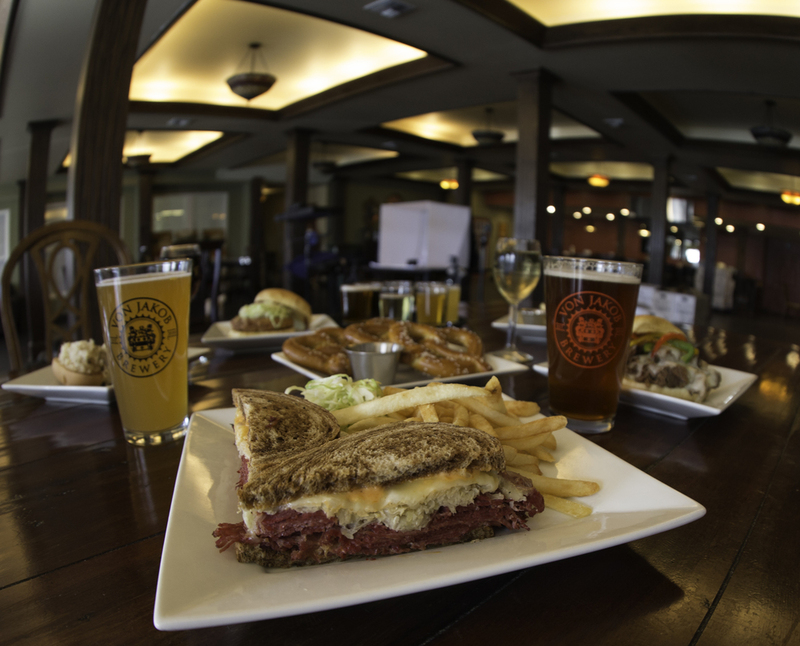 We serve a wide variety of dishes such as our Half-Pound Burger or our scrumptious Von Jakob Philly Cheese Steak. We even serve the traditional German cuisine: Schnitzel. There are quite a few drink options to choose from as well. We have a detailed menu of cocktails, craft beers, and wines that are exceedingly enjoyable. One of the most well-known locations in the Shawnee National Forest is the Garden of the Gods. This area of thirty-three thousand acres stretches over Saline, Pope, and Hardin County and is packed with trails for hiking, bluffs for climbing, camping and hunting options too. There are over five and a half miles of interconnecting trails and all are marked with educational signs outlying the history and geology of the breathtaking location. One of the better-known trails, Observation Trail, is only a half mile long and you can take your dogs with you so they too can have some great fun in nature. Garden of the Gods also has bluffs that are over one hundred feet tall and offer a unique view of the Shawnee Wine Trail that cannot be beat. In the foothills of the Ozark Mountain range—and only twelve minutes away from Von Jakob Winery and Brewery--there is a one hundred eleven feet tall monument: The Bald Knob Cross of Peace. Located on top of Bald Knob Mountain and built in 1963, this cross comprised of over nine hundred heavy gauge steel panels painted with a bright porcelain veneer was one of the most popular tourist attractions in Southern Illinois. At night, it is lit by forty thousand watts of light and can be seen for seventy-five hundred square miles. On each of its sides there is a message carved in granite: Peace, Hope, Faith, and Charity. Bald Knob Cross hosts a plethora of events like their upcoming Great American Eclipse on August twenty-first this year. This event marks the point of greatest duration (where the total eclipse lasts the longest along its entire path) in the Western Hemisphere so it is an astronomical occasion on the Shawnee Wine Trail you don’t want to miss. Shawnee National Forest has so many beautiful places to visit and breath-taking sites to see that it’s practically impossible to see them all in one day. What better reason to make a reservation for one of our southern Illinois bed and breakfast cottages and stay awhile? That way you can enjoy a relaxing weekend at a popular vineyard and don’t have to drive particularly far to see all the Shawnee Wine Trail has to offer.